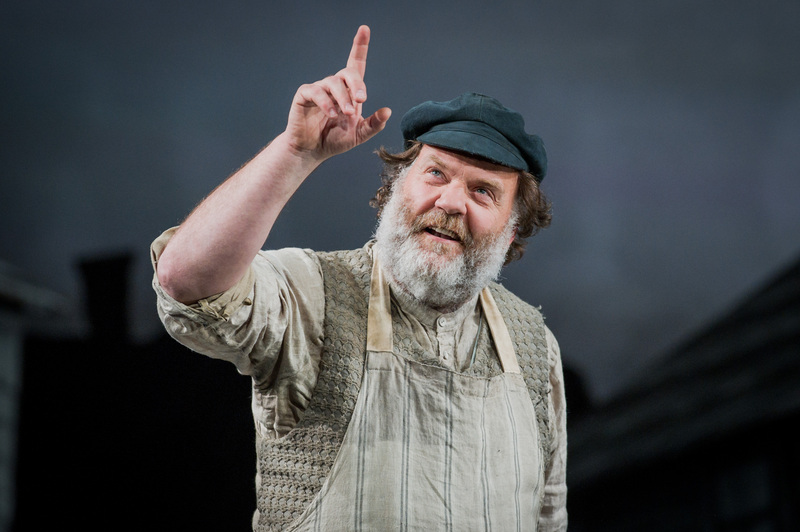 Bryn Terfel Jones was born in Pant Glas, Caernarfonshire, North Wales, the son of a farmer. His first language is Welsh. He knew of another Welsh baritone named Bryn Jones, so chose Bryn Terfel as his professional name. He had an interest in and talent for music from a very young age. A family friend taught him how to sing, starting with traditional Welsh songs. After winning numerous competitions for his singing, he moved to London in 1984 and entered the Guildhall School of Music and Drama where he studied under Rudolf Piernay. He graduated in 1989, winning both the Kathleen Ferrier Memorial Award and the Gold Medal. The same year he came second behind Dmitri Hvorostovsky in the Cardiff BBC Singer of the World Competition, but won the Lieder Prize. In 1990 Terfel made his operatic début as Guglielmo in Così fan tutte at the Welsh National Opera, and later in the same season he sang the title role in The Marriage of Figaro, a role with which he made his debut with the English National Opera in 1991. His international operatic career began that same year when he sang the Speaker in Mozart’s Die Zauberflöte at the Théâtre de la Monnaie in Brussels and he made his United States début as Figaro at the Santa Fe Opera. In 1992 Terfel made his Royal Opera House, Covent Garden début as Masetto in Don Giovanni, with Thomas Allen in the title role. That same year he made his Salzburg Easter Festival debut singing the role of the Spirit Messenger in Die Frau ohne Schatten. This was followed by an international breakthrough at the main Salzburg Festival when he sang Jochanaan in Strauss’s Salome. He went on to make his début as Figaro at the Vienna State Opera and his debut at Covent Garden as Masetto in Don Giovanni. That year, he also signed an exclusive recording contract with Deutsche Grammophon, and returned to the Welsh National Opera to sing Ford in Falstaff. In 1993, he recorded the role of Wilfred Shadbolt in The Yeomen of the Guard, by Gilbert and Sullivan and sang Figaro to acclaim at the Théâtre du Châtelet in Paris. Terfel has said that he would like to record “an album of Gilbert and Sullivan arias”. In 1994 Terfel sang Figaro at Covent Garden, and made both his Metropolitan Opera and Teatro Nacional de São Carlos débuts in the same role. He also sang Mahler’s Eighth Symphony at the Ravinia Festival under the baton of James Levine. However, back surgery in 1994 (and again in 2000) prevented him from performing in several scheduled events. In 1996, he expanded his repertoire to include Wagner, singing Wolfram in Tannhäuser at the Metropolitan Opera, and Stravinsky, singing Nick Shadow in The Rake’s Progress at the Welsh National Opera. These performances won him the Royal Philharmonic Society Award for the singer of the year. In 1997 Terfel made his La Scala début as Figaro. In 1998, he had a recital at Carnegie Hall which included works by Wolf, Fauré, Brahms, Schumann, Schubert, and others. In 1999, he performed in Paris the title role of Don Giovanni for the first time and sang his first Falstaff at the Lyric Opera of Chicago; the latter of which he reprised in the inaugural production at the newly refurbished Royal Opera House. In 1999 Terfel performed the Rugby World Cup anthem World in Union with Shirley Bassey at the Millennium Stadium before the 1999 Rugby World Cup Final. In 2003 Terfel hosted and performed on the stage with opera tenor José Carreras and soprano Hayley Westenra in front of the capacity crowd of 10,000 people from Faenol Festival in Wales. In 2007 Terfel performed at the opening gala concert for the re-dedication of the Salt Lake Tabernacle with the Mormon Tabernacle Choir on 6–7 April. Later, he performed the title role in a concert version of Sweeney Todd that had four performances from 5–7 July at London’s Royal Festival Hall. This idea came from Terfel and his fellow bass-baritone and friend, the Irishman Dermot Malone. Terfel has not shied away from popular music either. He has recorded CDs of songs by Lerner and Loewe and Rodgers and Hammerstein. In 2001 he commissioned and performed ‘Atgof o’r Sêr’ (‘The Memory of Stars’) in the National Eisteddfod with the composer Robat Arwyn. In September 2007 Terfel withdrew, to severe criticism, from Covent Garden’s Der Ring des Nibelungen when his six-year-old son required several operations on his finger. But he did successfully return to the Met in November 2007 to sing the role of Figaro. He told reporters in New York City that he would retire Figaro from his repertoire. But he did sing the role of Wotan in Covent Garden’s revival of the Der Ring in September to November 2012. In 2010 Terfel made his debut as Hans Sachs in Wagner’s Die Meistersinger in a production for Welsh National Opera, in Cardiff and on tour. On 17 July 2010, the cast of this production gave a “concert staging” at the Royal Albert Hall as part of the 2010 BBC Proms, which was broadcast on BBC Radio 3 and on BBC Four television. On 31 July, again at the Proms, he performed in a concert from the Royal Albert Hall celebrating the works of Stephen Sondheim, in his 80th birthday year. Terfel took on the role of Wotan for the premiere performances of Robert Lepage’s new Met staging of Wagner’s Der Ring 2010-12. He sang the role in all three of the four Der Ring operas that feature Wotan: Das Rheingold, Die Walküre and Siegfried. In September 2013 Terfel collaborated with Mormon Tabernacle Choir released the album Homeward Bound which reached No. 58 Official UK Charts. In September 2014 Terfel reprised his role as Sweeney Todd in the Live from Lincoln Center concert production of Sweeney Todd, which was broadcast on PBS. This production also starred Emma Thompson as Mrs Lovett and Audra McDonald as the Beggar Woman/Lucy Barker.